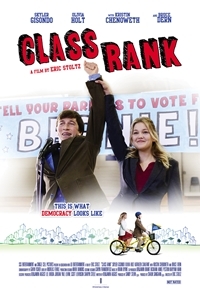 Class Rank follows teenagers Bernard, who lives with his quirky grandfather Oswald, and Veronica, a type-A personality with Ivy League aspirations who aims to step out from under her TV Producer-mother's shadow. When Veronica approaches Bernard to run for the Board of Education, he sees it as a chance to reform the local school system to enable him to better care for his grandfather. Veronica meanwhile schemes to eliminate the class-ranking system to better her chances of getting into Yale. While wooing the local paper's Editor in Chief for an endorsement, Bernard sees her as a potential partner for his grandfather. As Bernard and Veronica's campaign progresses, the two discover the meaning of love and the importance of helping others.